A year has passed since SummerTime Surfing began. 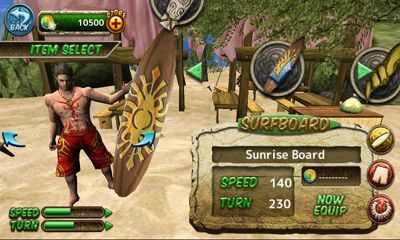 Now, Ancient Surfer is back more stylish than before! This time, surf Earth to surf Space! through large-scale events like never before in this next-gen Surfing game! Move your surfer downward to pick up speed. Bumping into obstacles in the water will slow you down. Gain speed and take off out of the water for jumps. Get enough hang time to pass the trick line for more stylish jumps. To complete a trick, simply follow the on-screen commands. Complete a trick, then spin some more for more points and coins! There are 45 tricks in all! Dont forget to stick the landing, or youll lose out on all those points! With over 100 types of boards, necklaces, and wear, you can easily personalize your surfer! 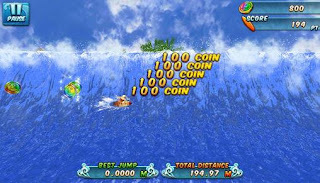 Collect Rainbow Coins to unlock more skilled surfers. Upgrade your board for more power! Combine different items for faster surfing and higher jumps! World-wide events allow you to challenge surfers in real time around the globe. Weekly events come with prizes like Rainbow Coins and Artifacts. Monthly events offer seasonal items. Grand champion tournaments deliver special items! A change in difficulty means a change in the required items to participate. The more difficult the event, the bigger and better the prizes! Chill with a friend or challenge the world... Its up to you. Surfs Up!